TopSpec Stud Feed Balancer is designed for broodmares, youngstock and stallions. It contains several supplements combined with a feed designed to promote muscle development and function. It includes a broad spectrum supplement, a hoof supplement, anti-oxidants and digestive aids. TopSpec Stud Feed Balancer improves the amount of nutrients a horse can extract from his total diet (forage and concentrate). This means that breeding stock can receive optimum nutrition from reduced levels of hard feed, with many resulting benefits. It greatly improves hoof, skin and coat quality, and helps to maintain their appetite, while also moderating the effects of stress on horses, and helping to maintain a healthy immune system. 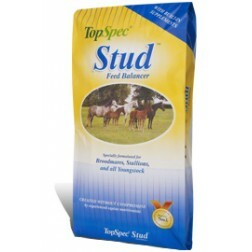 TopSpec Stud Feed Balancer is very palatable, and beneficial for foals from three weeks of age. There are currently no questions for Top Spec Stud Feed Balancer for Horses - be the first to ask one!